Steven Verdell Howse, widely known as Layzie Bone, was born on 23 September, 1974 in Cleveland, Ohio, USA. He is an American rapper and hip-hop artist. He is famous for being a member and unofficial head of the popular 90s rap group “Bone Thugs-N-Harmony”. Layzie was also known by the names L-Burna and The#1 Assassin. His older brother, Stanley Howse (best known as Flesh ‘N’ Bone), and his cousin, Charles Scruggs (best known as Wish Bone) were also members of the group. Layzie is also known as a CEO of the record label Harmony Howse Entertainment and a member of the rap group The Bone Brothers. 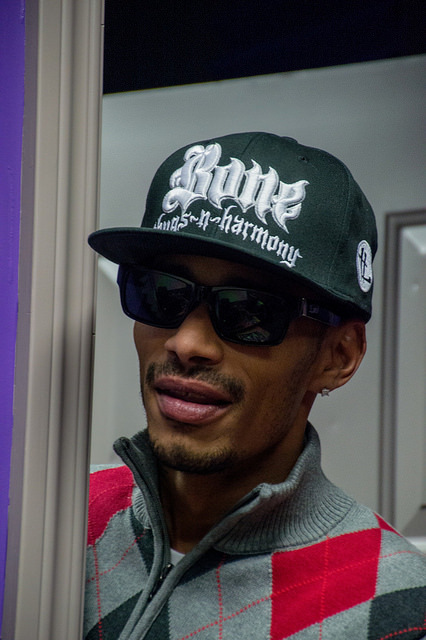 Do you want to know how rich is Layzie Bone is? What`s his net worth as of early-2016? According to various credible sources, Layzie is a wealthy man with an estimated net worth of an incredible $5 million dollars. He has earned all of his money from his music career as a rapper. When Layzie was in 7th Grade, he met Anthony Henderson (best known for his stage name Krayzie Bone) who became a good friend of his. After several years, he met Bryon McCane (best known as Bizzy Bone). When he finished his second year of high school, he left his hometown and went to live in Texas with his uncle, but the distance didn`t separate him from his dear friends and his cousin Charlie (Wish Bone). Instead of that, he was missing them all the time and that was the period when he started thinking about going back and making a musical career with them. He went back, reunited with his friends and this can be considered as the early beginnings of the group. The band was originally called “B.O.N.E. Enterpri$e” and consisted of four members (Layzie Bone, Krayzie Bone, Bizzy Bone and Wish Bone). In the year 1993 they released their first album called “Faces of Death” which brought them their first earnings in the music industry. After hitting the top of the charts, Layzie and his band gathered all the money they had to buy one-way bus tickets to Los Angeles, in order to show their talents to Eric Wright (best known as Eazy-E), their favorite rapper. Until they managed to call him, Layzie and his friends were practically living on the Los Angeles streets. They didn`t succeed in their first attempt to impress him, and later, when they got an information that Eazy E was in Cleveland, they went back in their hometown. They finally rapped in front of him, in person, and Eazy-E was so impressed that he immediately signed them to his Ruthless Records label. Layzy and his band returned to Los Angeles the next morning, and their wealth – making career began. They changed their groups` name to “Bone Thugs-N-Harmony” and one more member joined them – Layzie`s older brother Stanley Howse (Flesh ‘N’ Bone). The “Bone Thugs-N-Harmony” published many solo albums, “The Art of War” and “Strength & Loyality” being the most famous. These albums were a useful addition to his net worth. After the death of Eazy-E, in 1995, Layzie and Krayzie formed the label Mo Thugs Records which consisted of artists and friends from Cleveland. But, apart from being a member of a famous rap group, Layzie Bone has a successful solo career also. In the year 2001 Layzie released his first solo album “Thug By Nature”. He published several other solo albums which had a great influence on increasing his net worth. This year in April, a new album is expected to be released by Layzie, so undoubtedly his wealth is going to increase significantly. To speak further of his accomplishments, Layzie Bone has collaborated on albums of many famous hip-hop artists, and he has also appeared in a few movies, which of course added to his net worth. In his personal life, he has been married LaTonya Howse, but they divorced. Now he is married with the hot singer Felicia Lindsey-Howse and they have one child. 1 Children - Jeremy, Tyrone (deceased) and Steven. 2 Is the brother of bandmate Stanley "flesh-n-bone" Howse and the cousin of Charles "wish bone" Scruggs. Southpaw 2015 writer: "Notorious Thugs"
Down to Earth 2001 performer: "Up Against the Wall"